Last Sunday at Michigan, I randomly rode up the elevator to the press box level with Mike Joy. Since the press box was right next to the TV booth at Michigan, Joy invited me to watch part of the race with the NASCAR on FOX gang to get a feel for what they do. I thought I had a pretty good idea of what it would be like, but there were a few surprises and eye-openers about the experience. 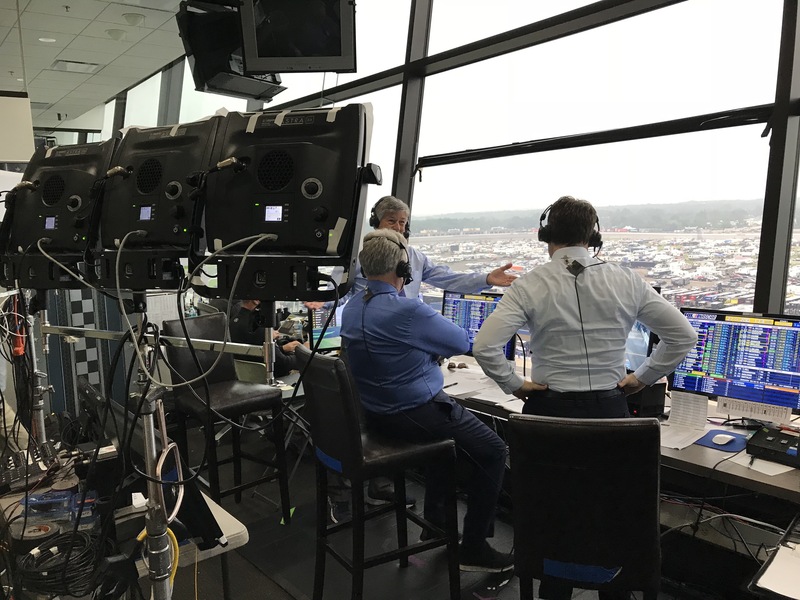 For some reason, I pictured Joy, Darrell Waltrip and Jeff Gordon standing shoulder to shoulder while broadcasting and staring out the window — not really looking at each other while talking. As the race unfolds, there’s quite a high level of interaction between them while they speak — eye contact, a hand on the other’s arm, excited gestures or motioning toward something on the screen or track. Each man has his own chair — one of those tall chairs you’d use to sit at a high top at a bar — but they often would stand up and take a step toward the others while talking or making a point. It was much more of a real conversation between the three than expected –and at a higher volume as well. Joy, for example, really projects his voice and it booms in the room (but it sounds normal on TV). There seemed to be a good energy in there. There’s direct interaction between the three broadcasters during the race. With the race going on, I figured the broadcasters would either be looking solely at the track or their monitors showing the camera feed. But there’s actually an impressive amount of statistical information at their fingertips. First of all, the FOX scoring monitor — which you’ve likely seen photos of on Twitter — is even cooler than I thought. Yes, they have information like “biggest movers” on the screen — but they also get data such as the last lap each car pitted. Super valuable! That makes it easier to see what strategies are unfolding. Another enviable stat: FOX’s scoring monitor shows the position for each car on the most recent restart. I was drooling. But to me, the coolest piece of technology on the scoring monitor was a yellow box that was the equivalent of a proximity alarm. When two cars would get close on the track, a yellow box would appear around their car numbers on the monitor. That helps FOX’s director — as well as the commentators — identify where the battles are. On top of that, FOX (like NBC) works with a company called Racing Insights, which takes NASCAR’s feed and puts it into a database which broadcasters can pull from in real time. 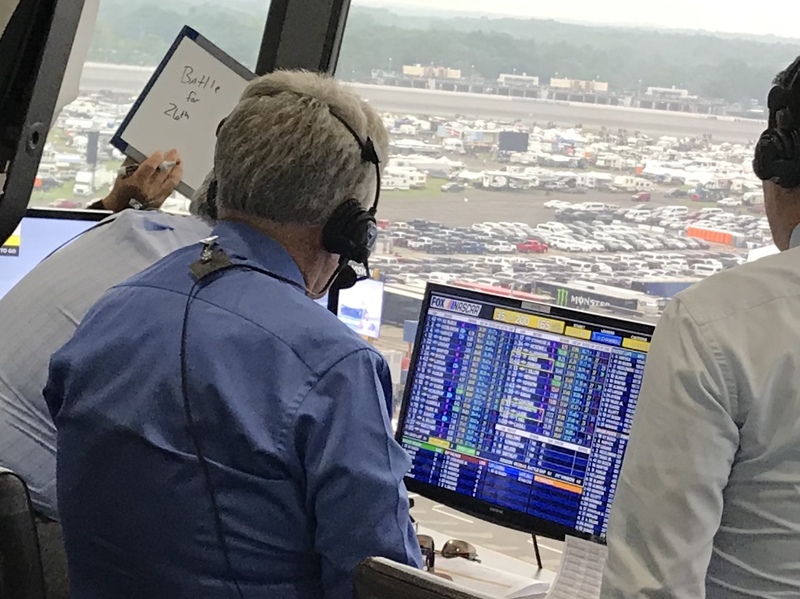 Larry McReynolds spends a lot of time looking at those stats during the broadcast (he has a separate room on the same level), where he can do things like see a chart that compares lap times. 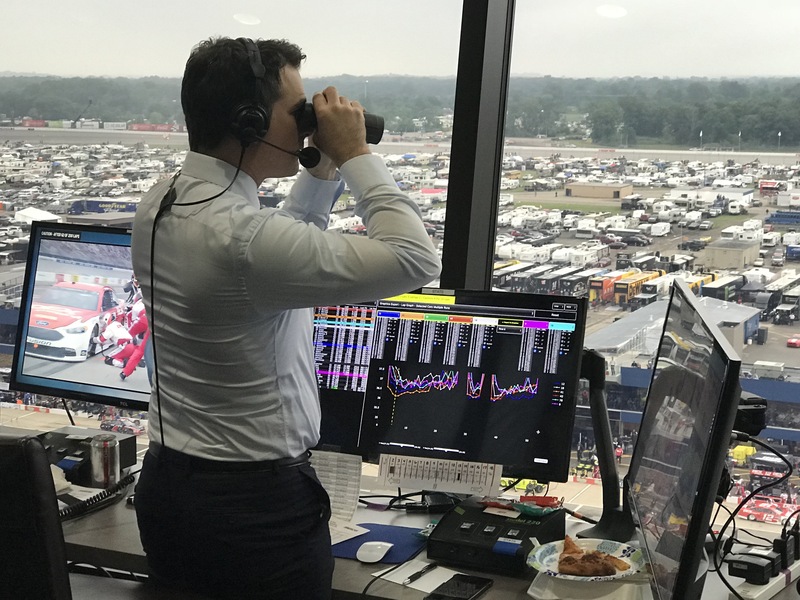 Jeff Gordon uses binoculars to watch the race off of pit road during each pit stop. The TV booth is just a smallish room that happens to have a great view. There’s a camera set up to record the few instances where the trio of announcers need to stand in front of it, a bank of portable TV lights and a small backdrop to the side where they make their mid-race picks. There aren’t many people in the room aside from Joy, Waltrip and Gordon. There’s a stage manager (Andy Jeffers) as well as a woman (Barb Hanford) who is in charge of the microphones and cameras, plus two guys from Racing Insights and a runner (who brought the announcers things like water, tea, Diet Coke and pizza). On this day, Joy’s son Scott was also hanging in the back of the booth. Most of the time, it seems like the broadcasters have to react on the fly to whatever is happening; when they’re talking about a replay, they’re seeing it for the first time along with the viewer. That makes Gordon’s ability to break it down in real time particularly impressive. Once in the room for a few minutes, it all feels so…normal. Since the camera isn’t on and the TV lights aren’t illuminated like in a studio, it just seems like being in a room eavesdropping on someone’s conversation. It’s easy to forget there are millions of people who are listening to whatever is said in the microphones. FOX’s scoring monitor has an automated system to highlight battles (indicated with a yellow box). In addition, members of the Racing Insights team will write on a whiteboard to help pass along notes (in this case, “Battle for 26th”).